As I've mentioned before, on weekdays I have to get up at half six for college. While it's not my favourite time to wake up, I've come up with a few ways to wake me up and make it more bearable. 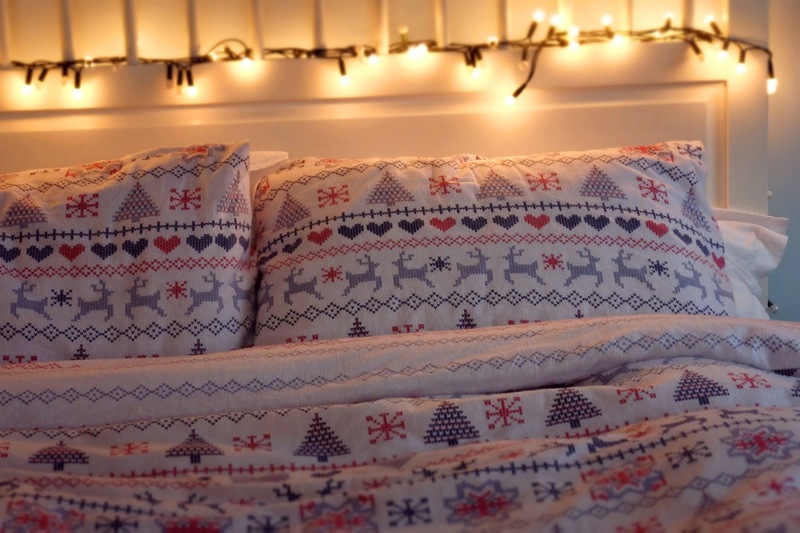 As soon as halloween was over I couldn't stop myself buying this festive duvet cover from Penneys and I think it was €22. It's brushed cotton and so soft and comfortable, making it even harder to get out of bed! As well as the tips I'm going to share below I also recommend getting at least seven hours sleep, without enough sleep it's very had to function at all. Without music early in the morning there isn't a chance of me being able to function for the day. I have an upbeat song set for my alarm and I change this every couple of weeks before I begin to resent it! Then once I'm out of bed I'll put my ipod on and listen to my favourite songs, I did a music post the other day and you can read that here. I make a cup of green tea or coffee and bring it in the car with me in a thermal mug. As it's getting colder a warm drink makes the early morning a bit easier and coffee is definitely a life saver if you didn't get enough sleep. My favourite tea is Twinings Apple and Pear green tea, it's a bit sweeter than usual green tea and so yummy! While I don't shower every single morning, if I'm feeling really tired a shower always helps to wake me up and get me ready for the day ahead. If I'm not having a shower, washing my face with colder water than usual also helps too. Lying in bed scrolling through Instagram and Twitter used to be one of my worst habits in the morning. Now I find that getting out of bed straight after my alarm goes of helps me wake up. I usually will turn the lights on as well to further stop myself from falling back to sleep (this has been known to happen). How do you deal with early mornings? If you've got any other tips for me, let me know in the comments! Thanks for reading!